Hey guys! 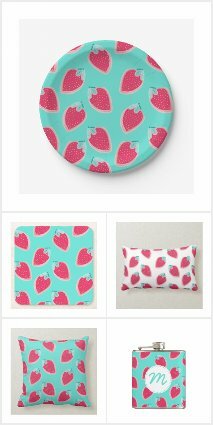 I've been busy creating new designs and one of my favourites is a bright and cute strawberry fruit pattern!! I've added this pattern to a wide variety of products on Zazzle... including craft supplies! wrapping paper and fabrics are my favourite things to design at my shop, so of course this repeating pattern was a must to put on those. This pattern is very versatile. It features a turquoise blue background colour, that can of course be customized by you! Change the colour to whatever you would like, change the size of the strawberries to get a different effect out of the design, even add a name! The gift tag and gift bag were just meant to be! Customize the text on the thank you tag to match whatever holiday or event you need it for. Even add someones name for a unique, personalized gift wrapping idea that they will want to keep. Sending a letter, party invitation, or package in the mail? Label it with one of these custom strawberry pattern return address labels. Add your name, address and contact information using the template! This pattern looks so good as wrapping paper! Wrapping paper is definitely where I would try experimenting with different sizes on the strawberries. This also looks great in a white background, or even a light pink. Last but not least, strawberry fruit pattern fabric! I don't sew myself... but I wish I could and I absolutely love to see other peoples creations. I would absolutely love to see this fabric turned into a lovely summer dress, or even a cute kids lunch bag! !